The true history of the land of steep hillsides, lush meadows and fertile valleys known today as Sugarloaf Ridge State Park begins at least 7,000 years ago, when Wappo Indians occupied the region and used Sugarloaf as their summertime home and hunting ground. The Wappo lived a simple existence for all those years, thriving in an overflowing land that could be called a paradise. But as told in “A Sugarloaf Reader” by Larry Maniscalco, a former history docent at Sugarloaf, that long chapter came to a tragic end in the 1830s, when disease wiped out much of the native population. From there the story of Sugarloaf accelerates, going from homesteads to ranches to hippie encampments, and culminating on Memorial Day Weekend, 1969, with the grand opening of Sugarloaf as a California State Park – making this the park’s 50th year in operation. Sonoma Ecology Center, the lead nonprofit managing the park under Team Sugarloaf, is proud to join our partners, supporters and volunteers – and all park-loving members of our community – in celebrating this 50th anniversary with a Memorial Day Weekend BBQ and other events. Please sign up for our newsletters, follow us on Facebook, or check our calendar to stay up to date as events are added throughout the year. Evidence of the hippie encampments remains to this day, according to Breck Parkman, who recently retired as senior state archaeologist for California State Parks. Later, a hippie heyday of sorts occurred on Aug. 16 and 17, 1987, when Sugarloaf was designated a “power center” for the worldwide Harmonic Convergence. More than a thousand people came to Sugarloaf that weekend to peacefully meditate as the planets aligned. It was Milo Shepard, grand-nephew of Sonoma Valley’s most famous resident, Jack London, who served as Sugarloaf’s first park ranger, ushering in its modern incarnation as a place where anyone and everyone can enjoy the trails, vistas, wildflowers and waterfalls Sugarloaf has to offer. The California State Parks system ran into budgetary problems in the mid-2000s, and several parks including Sugarloaf were threatened with closure. 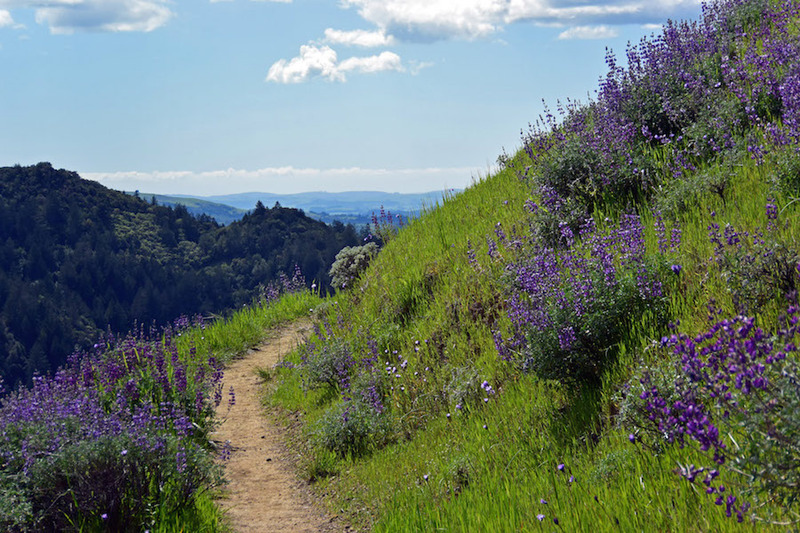 In 2006, Sonoma Ecology Center – in keeping with our mission of preservation, and with concern for the Sonoma Creek watershed at Sugarloaf – responded by assembling Team Sugarloaf, a consortium of five nonprofits with us as its lead. Team Sugarloaf succeeded in keeping Sugarloaf open to the public, and it remains open to this day. The park’s most recent challenge came in October 2017, when unprecedented wildfire swept through the region and burned three quarters of Sugarloaf. Despite loss of infrastructure – including several dwellings, miles of trails and three bridges – volunteers, supporters and staff were able to get the park reopened within four months, and fully reopened within a year. Today the park, at over 4,000 acres, is more accessible than ever before thanks to our improved trails, guided hikes, and educational programs such as Senderos Naturales, which introduces the local Spanish-speaking community to Sonoma Valley’s open spaces. Please help us celebrate 50 years of Sugarloaf Ridge State Park by joining us on hikes and events, purchasing a special Sugarloaf Anniversary Membership – or simply by visiting the park at any time.